In Access, Excel, PowerPoint, and Word: Click the Microsoft Office Button > Options > Proofing. 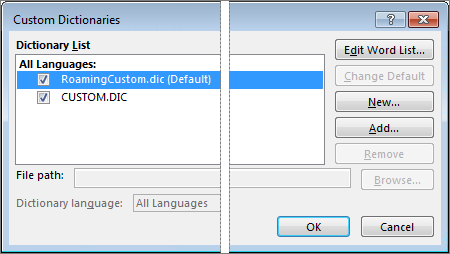 In InfoPath, OneNote, Publisher, and Visio: Open a file, and then click Tools > Spelling > Spelling Options. In Outlook: Click Tools > Options > Spelling > Spelling and AutoCorrection > Proofing. In Project: Click Tools > Options > Spelling > More Spelling options. 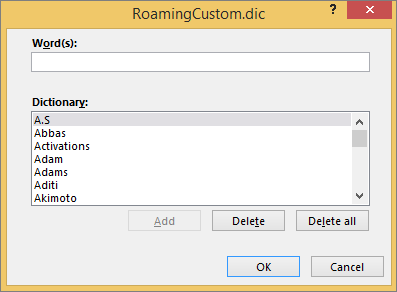 Open the Custom Dictionaries dialog box by following the steps in the section above.